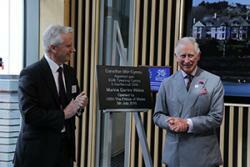 HRH The Prince of Wales officially opening the University’s new Marine Centre Wales. Visitors to the Menai Seafood Festival on Saturday (20 August) will have an unique opportunity to see behind the scenes at Bangor University's brand new Marine Centre Wales in Menai Bridge. During what will be the first public open day since the Centre was officially opened by HRH The Prince of Wales in July, there will be interactive displays, demonstrations and walk-in cinema screenings showcasing the innovative work carried out by the School of Ocean Sciences. Built at a cost of £5.5M, Marine Centre Wales is a state of the art, ecologically sound facility for the growing marine sector in Wales. The Centre provides a focus and access to expertise and a collaborative space for researchers, commercial operators, and agencies in the Welsh marine sector. Professor Colin Jago, Dean of the College of Natural Sciences at Bangor University explains: "Menai Seafood Festival - with its focus on local seafood, the marine environment and coastal heritage - gives us the perfect opportunity to invite members of the public to come and learn about what we do here. There is a great deal of innovative research and industry development that goes on in the Centre that people don't necessarily know about. 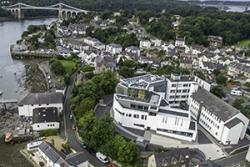 The new Marine Centre Wales building can be seen clearly in the foreground of the School of Ocean Sciences site in Menai Bridge. "The open day will encompass marine renewable energy, climate change, Irish Sea fisheries, coastal processes and resilience, and tropical marine environments to emphasise both the local and global science that we do. There will be access to our world class labs, with heavy oceanographic equipment and marine creatures on display, and marine biologists will be on hand to give talks and share information. "When we opened our doors to the public during the Festival in the past, before the new Centre was built, we had thousands of people come to enjoy learning about our work. With a lot of interest locally in the new Centre, I have no doubt that we will be even busier next week." An original sculpture created by artist Jane Evans will be on display in the atrium of Marine Centre Wales during the Festival. As part of the Festival's education programme with primary schools in the area, local children collected hundreds of plastic bottles in preparation for art workshops where they created decorative fish and other sea creatures to be hung as bunting throughout the Festival site. 200 of those bottles were used by Jane to create her sculpture. She said: "I was invited to make work for the atrium space of Marine Centre Wales after I had come up with an art & education programme for schools. With the help of Angesey Sea Zoo we have been highlighting the problems of plastic pollution in the marine environment with 7 local primary schools and then using plastic bottles to sculpt fish and jellyfish. We also worked with year 8 pupils from Ysgol David Hughes to make seagulls. 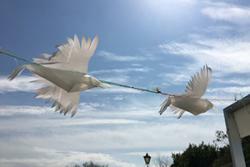 Artist Jane Evans worked with pupils at Ysgol David Hughes to create these seagulls. "It seemed totally appropriate to continue working with the plastic bottles myself and to use this piece as the culmination of the project. Whilst I hope it will be enjoyed as a beautiful piece of art, it is also intended to draw attention to very serious issues around protecting our coastal environment and the importance of recycling and reusing damaging materials such as plastic." Menai Seafood Festival will be held in Menai Bridge for the fourth year running on Saturday, 20 August. The Festival Concert featuring Meic Stevens, Al Lewis Band, Sera & Band and Anglesey Youth Choir will be held at Prince's Pier at 6pm on Friday, 19 August. Tickets are priced £15 adults, £10 concessions and are available from Dylan's Restaurant, Menai Bridge.